Two things let the film down in my view. The first is the lack of any obvious human tension. Escaping from a Russian Gulag is ‘drama’ to be sure, and so is survival against all odds, but somehow we are always searching for more than that, we need to know what people are thinking. One of the best, and surely most tense survival stories has to be Touching the Void [IMDB], about Joe Simpson’s escape from Siula Grande in the Peruvian Andes in 1985, which he climbed with Simon Yates. But if we think about it, the tension is not only about whether Simpson can manage to live, but the whole horror of Yates having to cut the line on him, leading to him being on his own. 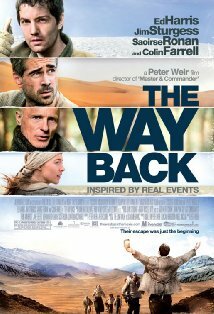 The Way Back lacks any real hook for getting into the minds of the characters. A few small incidents involving Farrell’s originally menacing, but ultimately, just cheeky, gangster are the closest we get. Anyway, what we have here is everyone speaking English most of the time, in various accents. Now, the reality of this film is that there are multiple nationalities and therefore languages, mainly Polish, Russian, plus Ed Harris’s character’s (American) English. To communicate they obviously needed a common language, however, this would have been Russian, probably with some German and/or French. It is a real stretch to imagine that so much English could have been used, and this is my purist complaint: if some element of the film continually pricks a hole in the otherwise oh-so-carefully-constructed reality, it makes it more like a play, less like the authentic immersion directors like Weir are undoubtedly aiming for. Yes, I know, Harris and Farrell don’t speak Russian. But there is not that much dialogue, and they both spoke a bit; a bit more would not have hurt them. Final comment: there is a lot of space in this film, in the dialogue, in its subject matter. I like films with space, e.g. Tarkovsky’s Nostalgia [IMDB], Crouching Tiger Hidden Dragon [IMDB] and Le Grand Bleu [IMDB]. Perhaps this one is worth a second viewing as well. 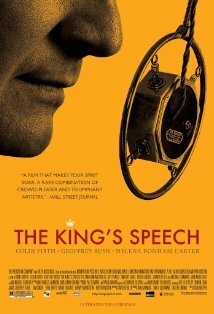 The King’s Speech [IMDB]: films like this remind me of the total pleasure of the cinema. This is pretty close to a masterpiece, or perhaps a master-class of dramatic acting by Colin Firth and Geoffrey Rush, with an outstanding supporting cast. Not one violent act occurs, not one gunshot, not one car chase, and yet the film is tenser than most serious thrillers. At its core is the road taken by King George VI to conquer his deep fears and insecurities, manifesting exteriorly as a terrible stammer. Firth plays the Prince, and then King utterly convincingly, giving us a man who is moral, intelligent, and quite probably a perfectly good regent – but one who is tormented every step of the way by his acute stammer, vastly exacerbated by the growing need to speak on radio and film. Rush, playing Lionel Logue, the actor-turned-speech therapist, is just as convincing, combining a certain Aussie charm with due professional seriousness, and of course, impeccable diction. There are two wonderful points of dramatic tension (as I am on the theme): the king’s internal battle with his own fears, and the often comic (to us) friction between the king and Logue, a commoner who not only refuses to use any form of royal address, but insists on calling the king ‘Bertie’. The support: Helena Bonham Carter is excellent as Queen Elizabeth (i.e. the Queen Mother as our generation knew her), regal in public, loving and supportive in private. Timothy Spall absolutely nails Winston Churchill (he has surely played him before somewhere); Guy Pearce plays the abdicating Edward with just the right mix of arrogance and dissolution; the amazing Jennifer Ehle strikes again as Logue’s wife (I am Australian, and I would not have picked her in a hundred years) and lastly the magnificent Michael Gambon’s only fault as the ailing King George V was not to have more lines. There are many amusing moments, and a few laugh out loud ones as well, but this is a deep and quite moving film. There is no escaping the emotion we all feel for King George as he inexorably heads toward the seeming abyss of his first radio speech to the nation, announcing war with Germany in 1939. No event could be more momentous for a king, nor more awful in failure. Well for those who have not seen it yet, I won’t spoil it: I will just say that it ranks which Touching the Void for pure tension, and that sounds an incredible claim about a film about a speech, then I say: get thee to a cinema. Let’s see an Oscar nomination at least for Firth on this one.